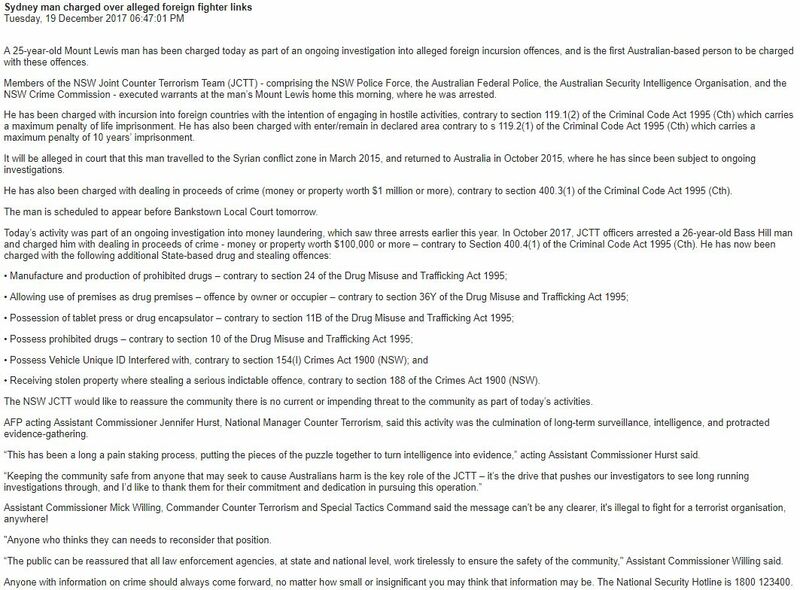 First Australian-based person charged under..
A 25-year-old Sydney man has become the first Australian-based person charged with foreign incursion offences for allegedly fighting in Syria in 2015. Officers from the Joint Counter Terrorism Team raided the man’s home at Mount Lewis, where he was arrested. It’s alleged he travelled to the Syrian conflict zone in March 2015 and returned to Australia seven months later, where he has been investigated ever since. He’s been charged with incursion into foreign countries with the intention of engaging in hostile activities and enter/remain in declared area, which carries a maximum penalty of life imprisonment. The man will face court tomorrow.